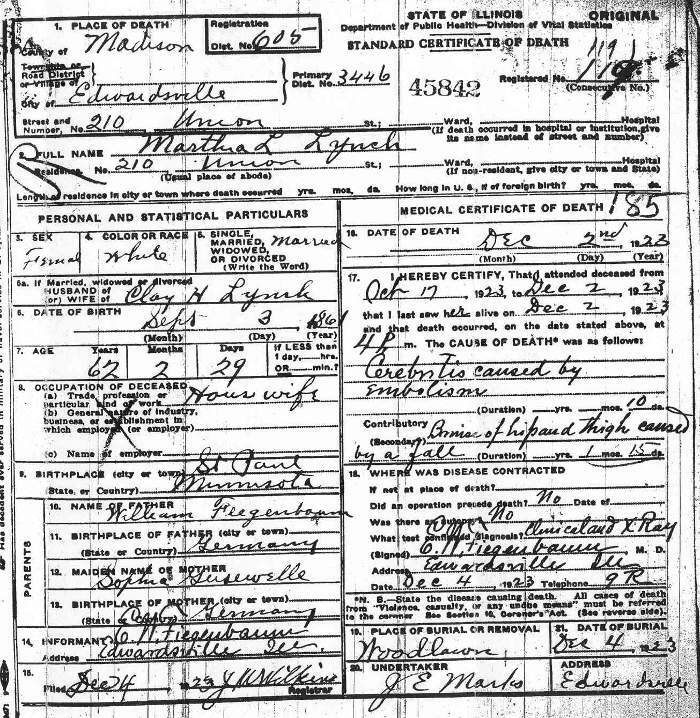 According to the death certificate, Martha L. Lynch, of 210 Union Street, died on 2 December 1923 at 4:00 p.m. at 210 Union Street, Edwardsville, Madison County, Illinois. E. W. Fiegenbaum, M.D., of Edwardsville, Illinois, had attended Martha Lynch from 17 October 1923 until 2 December 1923 and had last seen her alive on 2 December 1923. Dr. Fiegenbaum determined by clinical means and x-ray (there was no autopsy) that the cause of death was "Cerebritis caused by embolism;" a condition of 10 days' duration. A contributory cause was "Bruise of hip and thigh caused by a fall;" of 1 month, 15 days' duration. Dr. Fiegenbaum dated his observations 4 December 1923. E. W. Fiegenbaum was also the person who provided the Personal and Statistical Particulars for the death certificate. According to the document, Martha L. Lynch was a white female who had been born on 3 September 1861 at St. Paul, Minnesota. Her father, William Fiegenbaum, was born in Germany. Her mother, Sophia Gusewelle, was also born in Germany. Martha had been a "House wife" and was the wife of Clay H. Lynch. Dr. Fiegenbaum calculated that Martha had died at the age of 62 years, 2 months, 29 days. It was noted that J. E. Marks, of Edwardsville, would be in charge of the burial, to take place on 4 December 1923 in Woodlawn Cemetery. The death certficate was filed with the Registrar on 4 December 1923. Dr. Edward William Fiegenbaum, the attending physician and the source of the personal information for the death certificate, was a brother to Martha Lizette (Fiegenbaum) Lynch.